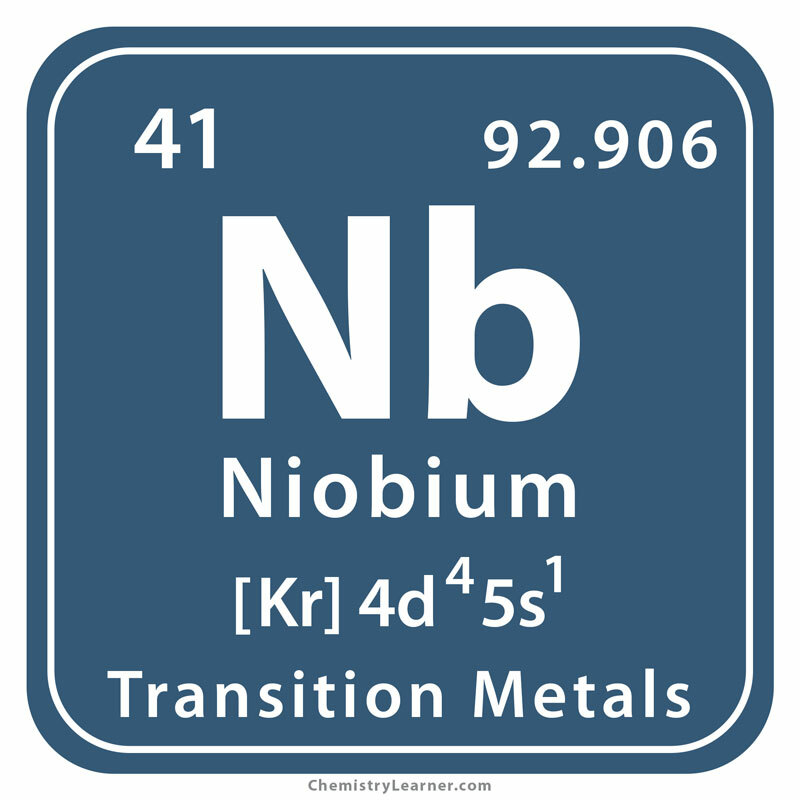 Niobium (pronounced as ni-OH-bee-um) belongs to the family of transition metals, denoted by the chemical symbol Nb. Defined as a soft and ductile metal with eighteen isotopes, it is available in the form of foil, sheet, tube, rod, and powder. When exposed to air (oxygen) at room temperature, it develops a bluish tint [1, 2, 11]. The metal is found associated with carbonatites in pyrochlore while its ore deposits have been discovered in the mining regions of Brazil, Canada, Russia, Zaire, and Nigeria who are also its major producers . It is named after Niobe, the daughter of King Tantalus in Greek mythology, who was turned into a stone while crying after the murder of his fourteen children . In 1864, the Swedish chemist Christian Wilhelm Blomstrand discovered the metal . Its actual year of discovery goes back to 1734 when John Winthrop, the first governor of Massachusetts Bay Colony and an avid mineral collector, found a new mineral that was sent to the British Museum and named it columbite. Later in 1809, Charles Hatchett, an English Chemist, while analyzing the same mineral, found a different element in it that was named columbium, but couldn’t be isolated. 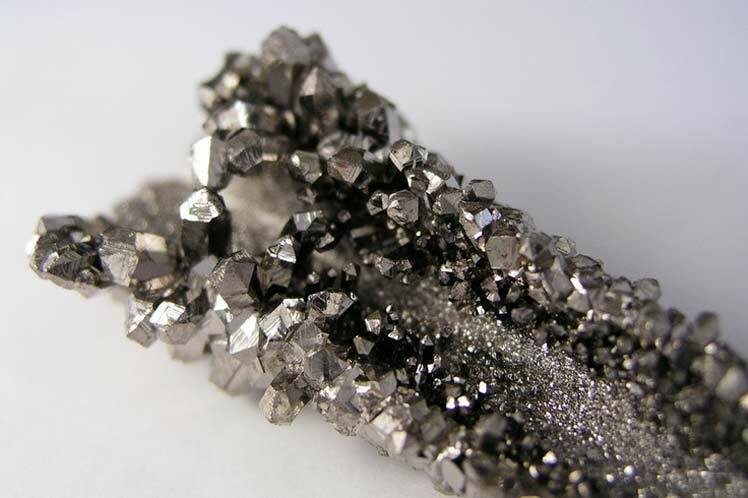 A new twist in the discovery of niobium took place in 1809 when the English chemist and physicist William Hyde Wollaston compared the mineral with another mineral called tantalite and announced that columbium was actually the element tantalum. Another confusion related to its finding arose in 1844 when Heinrich Rose, a German mineralogist, and chemist, used samples of columbite and tantalite to produce two new acids, niobic and pelopic that were believed to be similar to each other. It was resolved after twenty-two years by a Swiss Chemist called Jean Charles Galissard de Marignac who proved that the newly isolated acids were from two different elements. 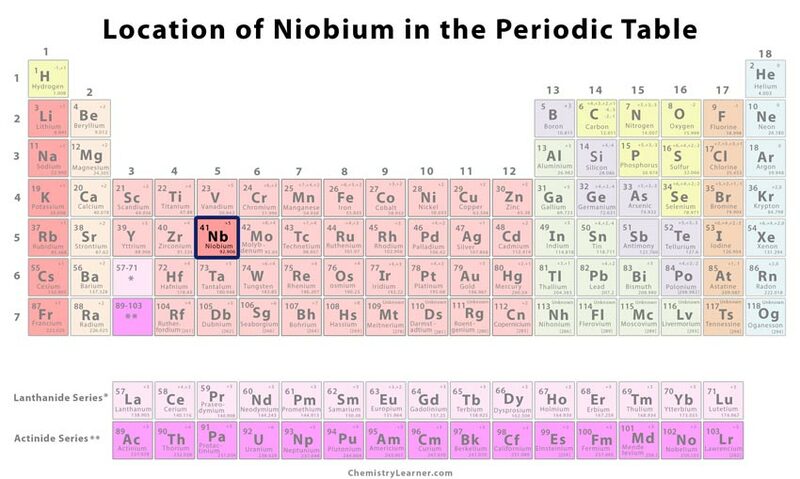 Then in 1864, Blomstrand finally isolated metallic niobium by heating niobium chloride with hydrogen [1, 3]. Its addition to low alloy stainless steel products like gas pipelines (niobium-silicide also used), automobile parts, airframe systems, and structural steel provides high-temperature strength and corrosion resistance for overcoming distortion when exposed to elevated temperatures [5, 7, 20]. 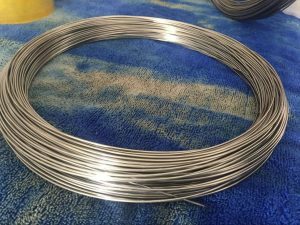 An alloy of Nb, Hafnium, and Titanium called C-103 Niobium, available as tubing, sheet, wire, and bar, is also a necessary material for the manufacture of aerospace components and other related products . 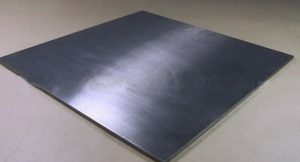 Since niobium carbide is insoluble in steels at all processing temperatures, it remains at the grain boundaries, reducing the excessive growth of grains (crystallites) when added to microalloyed steels . A combination of Nb, copper, and tungsten can be used as a composite cathode for arc-welding rods . While pure Nb (its disulfide as well ) functions as a superconductor (conducting electricity with no resistance when cooled below 9.25 K), it is often combined with titanium, and also tin, zirconium, and aluminum to make wires that work as superconductive magnets [3, 5, 30]. High-quality films of niobium-titanium nitride might be suitable for making superconducting copper cavities for high energy accelerators, and implants for knee joint surgery [9, 27]. One of its everyday uses is making lamp filaments. 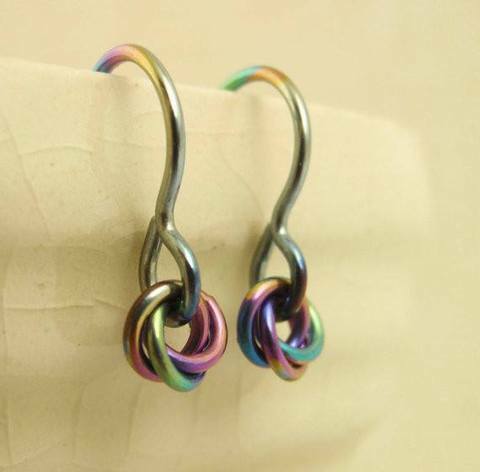 In addition to being hypoallergenic, its ability to undergo oxidation promotes anodizing  that helps in making necklace, chain, and several body piercing jewelry like earrings, captive bead and belly button rings, hoops, and nose studs [3, 16]. 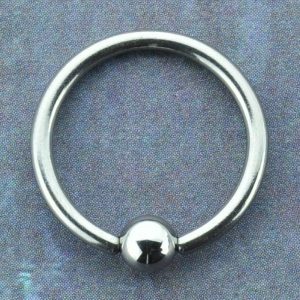 However, black Nb is not anodized but prepared by a special process to design certain rings . Niobium pentoxide/Niobium V oxide(Nb2O5) increases the capacity of multi-layered ceramic capacitors and the refractive index of optical glass for the production of thinner, lighter, and resilient lenses used in cameras and eyeglasses [5, 6]. The nanoparticles niobium oxide supported on carbon, and a low amount of platinum is a more effective electrocatalyst for oxygen reduction reaction than a commercial Pt/C catalyst . Niobium ethoxide is a precursor for depositing niobium oxide layers and other films doped with Nb that exhibit magnetic, ferroelectric, and conducting properties, useful in RAM (random access memory) and photovoltaic applications . Niobium sulfide, moderately soluble in water and acid, is compatible with sulfates that in turn could be utilized for water treatment methods . Niobium pentachloride is used as a Lewis acid catalyst for the activation of alkenes in the carbonyl-ene reaction and the Diels-Alder reaction as well as precursor for preparation of Nb and ferroniobium . Niobium Hydride is valued as a portable source of hydrogen . Niobium oxalate is used as a doping precursor in the PZT composition to enhance its piezoelectric properties . Niobium Fluoride is an effective catalyst for solvent-free cyanosilylation of aldehydes . Solid metal does not ignite. 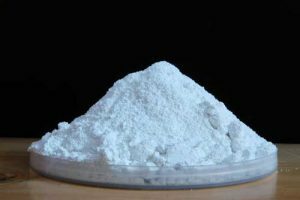 However, high surface area material such as 5-micron powder may undergo auto-ignition at room temperature that could be extinguished with dolomite, sand, sodium chloride, or soda ash. Inhalation: It may cause irritation of the mucous membrane when inhaled. Skin: It may cause irritation. Eye: It may lead to transient and mechanical irritation. Chronic exposure could result in conjunctivitis. 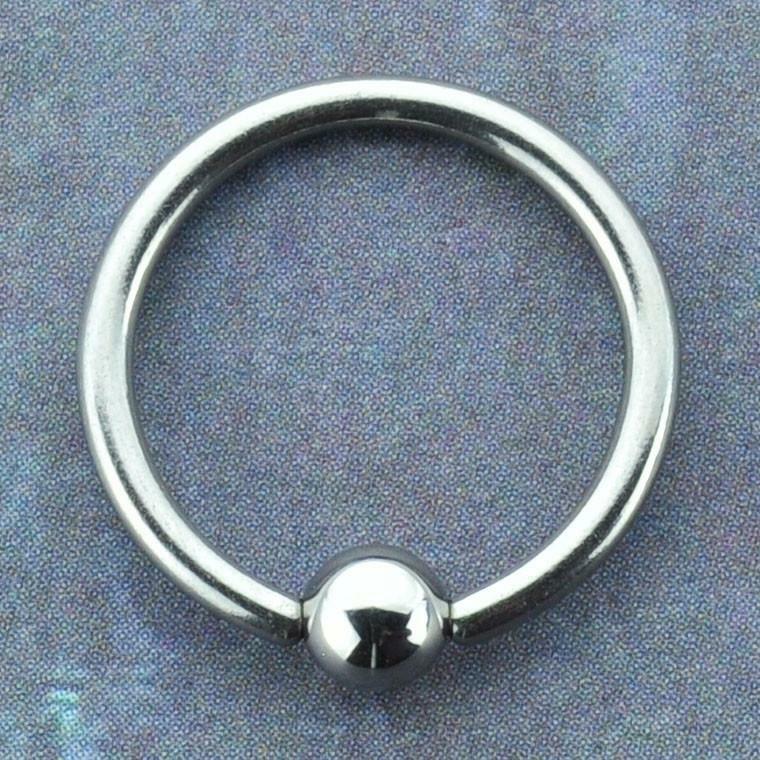 Ingestion: Metallic Nb has a low toxicity, owing to its poor absorption by stomach and intestines. In case of spilled material, use a proper container for disposal as per the Local, State, and Federal regulations. In the recent times, a new electric car battery has been developed by a well-known electronic company that has a titanium-niobium oxide anode material for greater lithium storage . At the Thomas Jefferson National Accelerator Facility, there is an electron accelerator with 338 Nb cavities immersed in liquid helium, capable of accelerating electrons closer to the speed of light, used by scientists to study the quark structure of matter . 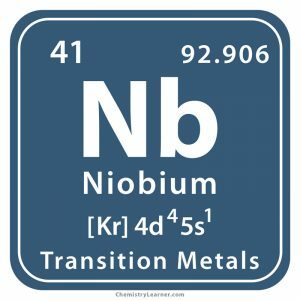 Niobium-germanium, a compound of Nb and Ge, was found to be a superconductor in 1973 that had the highest critical temperature until the discovery of cuprate superconductors in 1986 . The cost of the element in its pure form is somewhere between $15 and $18 per 100 grams (3.5274 ounces) .